How to select The Best Outdoor Solar Lights? How to install solar lights easily and efficiently? The reality is outdoor solar lights might look the same but they are not the same. To ensure you are getting the best outdoor solar light, there are some features you need to put into consideration. The beauty of having solar lights is the convenience of being able to install it anywhere you wish. This flexibility can be taken away when you buy pairs of solar lights that are wired together. This makes it only possible to have the lights installed only as far as the wires allow. Wireless outdoor solar lights, on the other hand, allow you to place your solar lights anywhere you want. This is why it is advisable to go for wireless solar lights. Harsh weather conditions will always have effects on appliances installed outside. This is the same with outdoor solar lights and this is why you should look for solar lights that are made to counter these weather conditions. It is essential to choose outdoor solar lights with water and heat proof feature so that you can have a long-lasting outdoor solar light. This is a fantastic feature for anybody that is security conscious. 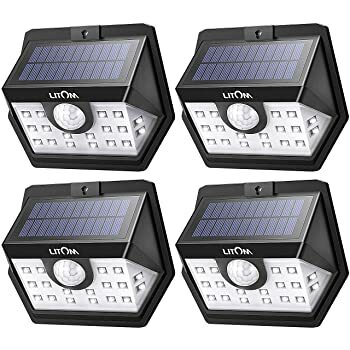 The motion detector will immediately trigger the solar light to turn on when there is movement around. This can help you spot intruders early. Solar light bulbs are measured in lumens and the higher the lumen count, the brighter the light. Your light use will always differ and it is advisable for you to choose the lumen rating that suits your use. If you need very bright light, go for solar lights with high lumen rating likewise if you need lower light, go for lower lumen rating. One of the biggest struggles is choosing an outdoor solar light from the vast options available. This is why we have decided to review some of the very best outdoor solar lights you can find. Check them out below and choose the one best suited for you. Are you looking for a product that suits any weather perfectly? Then the URPOWER solar light with motion sensor is the right product for you. This is because the manufacturers made the product weather resistant with IP64 waterproof and heatproof materials. Furthermore, the solar lights are specially designed by the company to have a wide angle reach and you will find it hard to see solar lights with the same designs as the URPOWER solar light. Additionally, the solar light is designed with 8 LED lights which make it brighter than the conventional four solar lights. 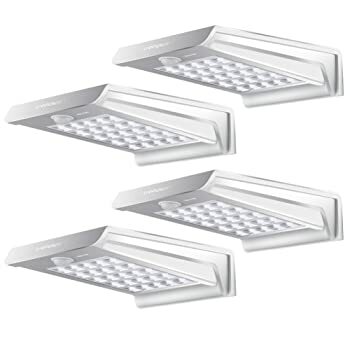 The 8 LED lights also make it last longer than the common 12 LED lights in the market. Another great feature of this product is its automated switch which turns on when it detects motion at night. It also turns off immediately the motion stops and it is worthy to note that the sensor range which spans 10 feet with 120 degrees is quite impressive. With a maximum charge time of 8 hours, this solar light also ensures that your solar lights get fully charged on time even in situations where the sun isn't shining. Finally, this solar light is suitable for almost any outdoor position you want it for. This is a product from Aootek Motion Detector Company and they have a wide range of products which this one happens to be one of their best. It is designed in such a way that the bright LED light can cover a wide area efficiently. Additionally, its waterproof IP64 and heatproof feature give it an edge over most products. This is because, with this feature, the solar light can be installed in any weather condition without worry. Interestingly, its motion sensor is also impressive as it can detect motion 26 feet from it within an angle of 120 degrees. Furthermore, its monocrystalline solar panel is very efficient and it can absorb 19% of the sunlight which is then converted into electricity. It's 2200 mah rechargeable lithium-ion battery also means that you have a brighter LED light and a battery that can stand the test of time. Finally, the solar light is made to suit various outdoor purposes like the patio, garden, pathway, just name it. LITOM is a world leading solar company and they have been known to be among the innovative companies in the industry. 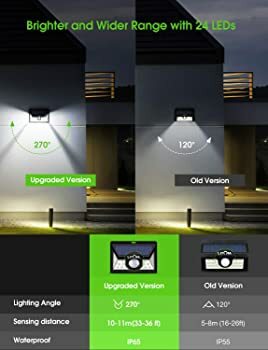 This product of theirs is specially designed to cover a wide area which is made possible because it has 3 LEDs on each side and a wide angle design. 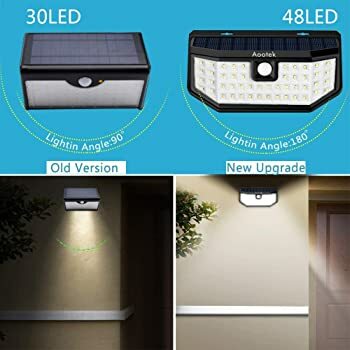 Additionally, with this product, you are promised bright 24 LED light that is brighter than the majority of solar lights in the same bracket with it. Furthermore, this product has 3 optional modes which are; The Full-On mode, the reduced light mode and motion detected mode. The full-on mode is suitable for your front door, back door, garden, etc. Whilst the reduced light mode is better suited for entryways and railings. Finally, the motion detected mode is better used for driveways, garages, gates and fences. The sensitive motion detector has a range of 26 feet when installed at a height of 6.5 feet. 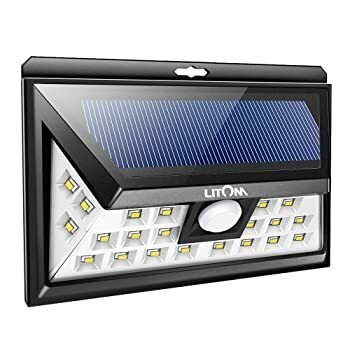 The LITOM 24 Led outdoor solar light is also weatherproof and this is because of its IP65 waterproof feature. With this, you can install the solar light in any weather condition without any problem. Finally, with its powerful lithium battery, you do not have to worry about your light running low quickly which is exactly what everyone needs. 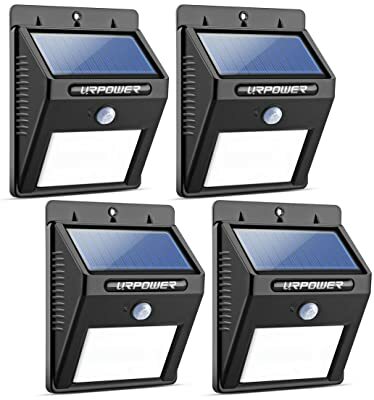 URPOWER's 20 Led outdoor solar lights are made in a pack of four and its 20 led bulb ensures you have a very bright light at night. This product is very easy to install and this is because there is no need for wiring. All that is needed for installing are screws which are provided for by the manufacturers. 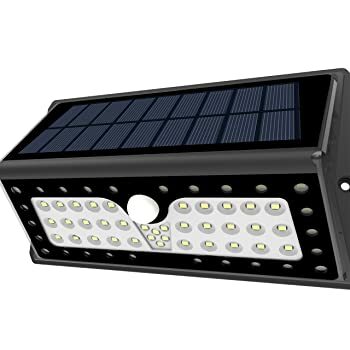 Additionally, the URPOWER 20 LED solar light is one of the strongest outdoor solar lights in the market. This is because it is made out of strong stainless steel which ensures they withstand any weather condition. Furthermore, its 1000 mAh 3.7V Li-on rechargeable battery is quite impressive as it can last for at least 10 hours when fully charged. Interestingly, its LED lamp body is detachable which makes it easy clean. Also, its motion illumination sensor stays on for a minimum of 20 seconds when movement is detected and turns off immediately after motion stops. Its motion detection range is also 10 feet which is pretty cool when compared to other products in the same range with it. Finally, the URPOWER 20 LED solar light is suited for almost any outdoor spots you wish to use it for. Made with strong stainless steel material that ensures that it can be used in any weather condition. Its 1000 mAh 3.7V Li-on rechargeable battery can last for over 10 hours when fully charged. Its detachable LED lamp body makes it easy to clean. The InnoGear upgraded solar light is one of the easiest solar lights to install. This is because all you have to do is stick it into the ground or screw it to a wall. This outdoor solar light is made heatproof and waterproof because of its IP65 feature which makes it able to withstand any weather condition. Additionally, its 200-lumen output ensures that you have a super bright light at night. Furthermore, it has an auto on and off feature which is pretty cool as it turns on at night and automatically turns off at sunrise. 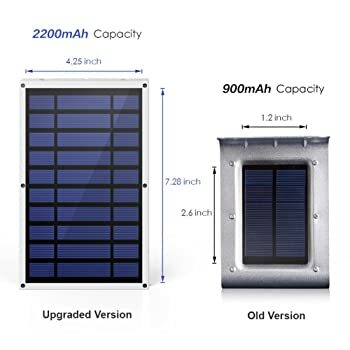 The innoGear solar light’s 18650 Lithium rechargeable 2200 mAh batteries are also one of the strongest among outdoor solar lights in its range. Finally, to ensure that your solar light is always in range of direct sunlight, the manufacturers made the solar panel adjustable. This will allow you to always have your solar light in a good position for charging. Mpow Solar lights have been upgraded to 8 bright LED lights that can illuminate a vast area of darkness effortlessly. It comes in a pack of two with a total LED output of 320 lumens. This solar light also has a bigger solar panel that allows it to gather rays of light easily for charging. Additionally, this product has 3 modes to choose from which are; constant bright light mode, bright light sensor mode and dim sensor light mode. The different modes make the solar light suitable for different uses like driveways, walkways, patio, etc. 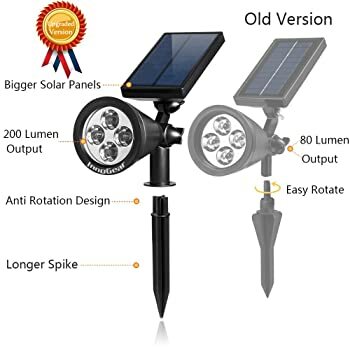 Furthermore, its sensor range of 10-26 feet is really impressive when you compare it with other solar lights in its range. Built with durable waterproof and heatproof material, makes this solar light one of the few that can withstand any weather condition. Finally, the inbuilt batteries ensure that the battery not only lasts longer but also stand the test of time. In your search for solar lights, you would have come in contact with the name ‘Lampat’. This is because they are a household name when it comes to innovations in the solar light industry. From the 62 LED light, you would have guessed how bright it is but the LED light is also a motion detector. The motion detector is known to detect motion up to 128 degrees and 28 feet away. Furthermore, when motion is detected, 36 LED lights shine cool white whilst the remaining 26 LED lights remain warm. Another good feature of this product is its durability and this is reflected by the transparent protective case made for it by the manufacturers. Additionally, its waterproof IP65 and heatproof feature make it a good product for any type of weather. Finally, the installation of solar lights can't come easier than the Lampat 62 LED. This is because all that’s needed are screws and anchors which are provided for by the manufacturers. None found at the time of review. 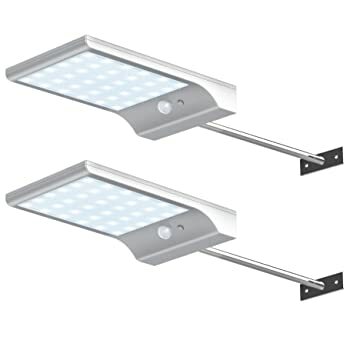 Innogear Solar gutter light has 36 LEDs that gives 450 lumens of light. The solar light has a large solar panel which makes it easier for it to absorb sunlight hereby making it get charged quickly. Additionally, when fully charged, the solar light can last for over 10 hours. It also contains a powerful 3.7V 2600 mAh battery that aids it to shine time. Installation of this product was also made easy with the inclusion of the aluminium pole by the manufacturers. 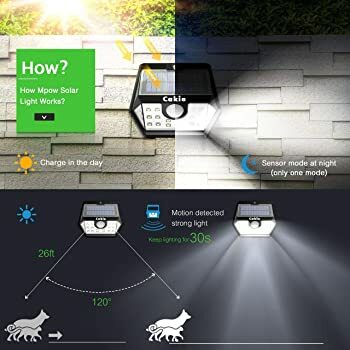 Furthermore, it has four different modes namely; dimmed light + full brightness light, Off + motion sensor full brightness light, ¼ bright light and ½ bright light. The sensor is very sensitive and it detects any movement whether it is from human or animal. 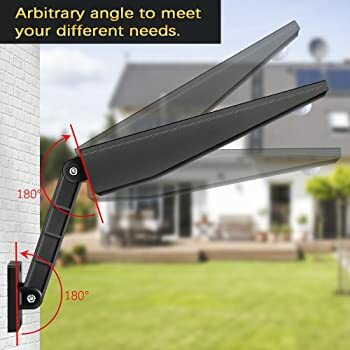 Finally, the solar light also has an extendable arm that allows it to be easily positioned for sunlight. LITOM is known as one of the biggest solar light companies in the world and their reputation supersedes them. 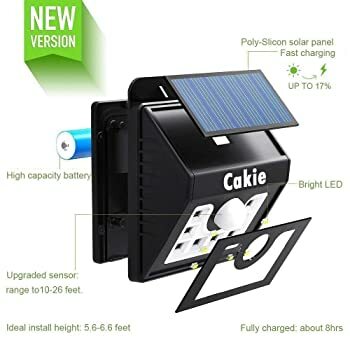 This is why when they introduced their 20 LED solar light with a wireless motion sensor, it was received with enthusiasm. Its solar panel is photoelectric and it absorbs sunlight higher than most solar panels which allow it to charge faster. 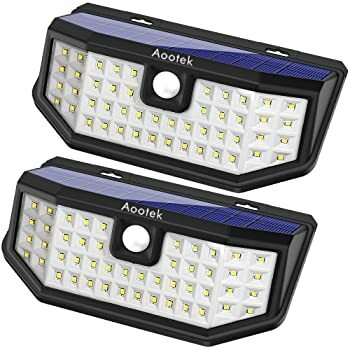 Furthermore, the brightness of one of these solar lights can cover over 200 square feet which are rare among solar lights in its price range. 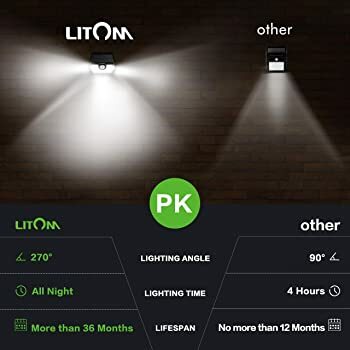 Additionally, the motion sensor is also impressive and this is because they developed their own PIR sensor that’s not only very sensitive but also long ranged. Also, the solar light always stays on for a minimum of 30 seconds after detecting motion. Finally, its IP65 feature covers its batteries and circuits making it very durable. Licwshi 48 LED 4500mAh Solar Light is one outdoor solar light with impressive features. Its 4500mAh battery is one feature that makes it stand out among other solar lights. With a battery that powerful, you are assured that your light will keep running for a very long time. Moreover, the battery is explosion proof which gives you an assurance that the battery will stand the test of time. Additionally, it has a flexible solar panel that allows you to adjust the solar panel for better sun exposure. Furthermore, with 900lumens or light, you will be getting one of the brightest outdoor solar lights in its price range. The quality of the materials isn’t to be questioned because it is made from strong rubber alloy material. This product is also weatherproof and you don’t have to worry if it can survive extreme weather conditions. 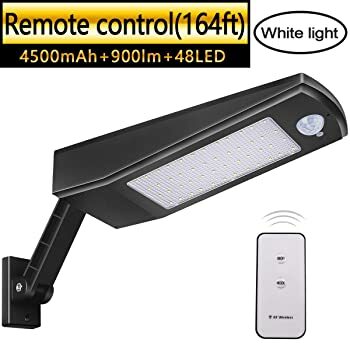 Not often do you see outdoor solar light with remote control but Licwshi took it a step further by including a remote control in their product. This remote allows you to turn on and off the solar lights from a distance rather than going directly to where the lights are installed. 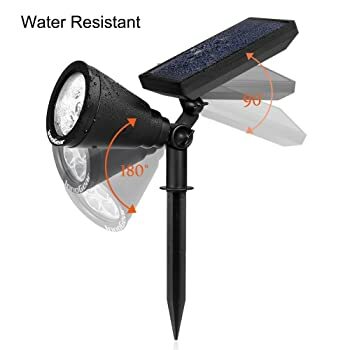 Finally, to assure you that this is one of the best outdoor solar lights, they have a 90-day money back guarantee and a warrant of 18 months on the product. Ever wondered what the benefits of using outdoor solar lights are? Then you are in luck because we will be writing about them in the paragraphs below. When you begin to calculate how much you spend on electricity monthly, you will definitely start thinking of a cheaper alternative. Using solar lights is exactly what you need because, with it, you are assured that your electricity bills will be reduced to the barest minimum. Although making the first investment which might be seen as ‘heavy' is tough, you will surely reap the benefits in years to come. Electrical wires can be very dangerous especially when there are kids around. The danger of electrical wires isn't limited to electrocution alone but to fire that can be caused by sparks or cable melting. These risks are mitigated by using outdoor solar lights. This is because, with solar, there isn't any wire visible, thereby making the environment safer for the people. Global warming is very real and some of our decisions tend to affect our planet one way or the other. It is interesting to know that solar energy is considered as clean/green energy. So, in conclusion, you will be doing the whole planet a favour if you decide to use outdoor solar lights. This is because green energy does not have any adverse effect on the planet. Looking for a power source that requires little or no maintenance? Then solar lights are for you. The solar batteries of outdoor solar lights do not need any special maintenance and you will only have to replace them after a few years. In addition, some solar panels are known to last for over 25 years which is rare among other sources of light. Although, you must note that the glass part of the solar panel must be cleaned frequently to ensure optimal performance. One major advantage of the outdoor solar light is the fact that there is always a product that suits your taste and need. They are outdoor solar lights specially designed for different uses like streetlights, patio, walkways, driveways, etc. The uses are endless and all you need to do is just order. Solar lights can be very pleasing to the eye and this is why it is a good option for beautifying the environment. With Outdoor solar lights, you are not only lighting up the environment, but you are also giving it an aesthetic value too. There are cases where power can be lost for a while. This isn’t the case with solar lights because as long as the solar lights are charged during the day, your outdoor solar lights will definitely light up at night. Installing outdoor solar lights is not a laborious task as most people believe. This is because there is no wiring involved which can make DIY installations dreadful. Although, regardless of how easy the process is, you still need some tips to be able to get the best out of your solar lights. If you continue reading, you will get all the necessary tips needed to install your solar lights. This is probably the most important tip you can get on installing outdoor solar lights. You can’t just decide to place your solar lights anywhere, strategic positioning is important. You need to position your solar lights in a place where they can get direct sunlight which will increase the rate at which they get charged. Another good tip is not to install your outdoor solar lights where they can easily be run over by cars or lawn mowers. This can be achieved by not placing the solar lights too close to walkways or driveways. If you are trying to illuminate a particular way; walkway or driveway, then it is advisable to just place the solar lights around the route to show directions. 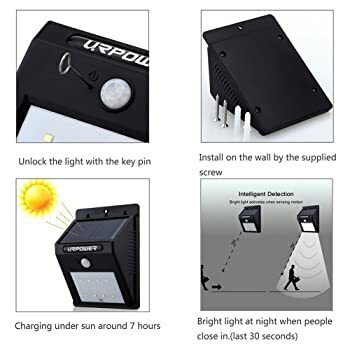 If you are trying to illuminate an object, then the solar lights should either be placed on the objects or close to it. If the solar light you are installing is the stake type that requires burying, then you should prepare the soil beforehand. This can be done by wetting the soil few minutes before time or by digging the soil with a fork or shovel. It is important that you do not try to dig the soil with the stake because it can get damaged. 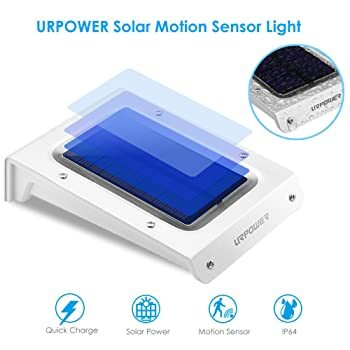 In this article, we reviewed some of the best outdoor solar lights and whilst all of them are great products, we recommend URPOWER's Solar Light Wireless Waterproof, Motion Sensor Outdoor Light for Patio, Yard & Garden. This is because of its quick charge feature, its bright 8 LED light, and most importantly its motion detector. As we said, the other products are great but the URPOWER's 8 LED outdoor solar light just trumps them all. In conclusion, we are sure that you have learned a lot about outdoor solar lights. We hope you do not just read our tips but also try to put them to good use. 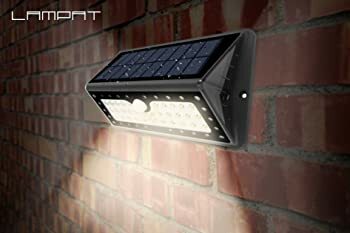 We are also sure that you have already learned about the benefits of using outdoor solar lights which we know will be one of the major reasons you will be buying outdoor solar lights. At the end of the day, we have made our recommendations but the final decision still lies with you. But one thing is certain; we have made your decision-making process easier. This solar light is designed with 8 LED lights which make it brighter than the conventional four solar lights. Another great feature of this product is its automated switch which turns on when it detects motion at night. It also turns off immediately the motion stops and it is worthy to note that the sensor range which spans 10 feet with 120 degrees is quite impressive.